A team in Canada is pioneering the way we will all watch VR demos and live-streams on the internet. If you haven’t come across some of the mixed-reality videos being shared by Northway Games of their HTC Vive game Fantastic Contraption recently, then you must watch the video that Kert Gartner uploaded of his latest VR demo experiment (shown above). The video is under 30 seconds, but is long enough to give you a glimpse into what its like to experience building in the world of Fantastic Contraption. The premise of the puzzle game is to build a “contraption” made of sticks that you can stretch or shrink to any length and cylindrical wheels that rotate, all to get a pink ball to its goal located in different parts of the environment depending on the game level. Normally, watching a demo or trailer of a VR game often shows a split screen of what the user is seeing (first-person perspective) and a second camera showing the user in headset interacting with the air using hand controllers. But what Gartner and the Northway Games team have created is a captivating look at mixing a spectator perspective with the user overlaid into the virtual world interacting with virtual objects. This means you can watch all the natural movement of the user while he or she interacts in virtual reality – pretty amazing. Gartner went even further with this latest video by attaching a third HTC Vive controller to a stabilized camera to track its movement giving the video an amazing cinematic quality to the whole thing. When speaking with Gartner about the camera mounted controller, he did say that Northway Games worked directly with Valve to add additional hardware to the Vive system in order to pair a third controller, but their process to create the mixed-reality video could be accomplished with just the two controllers that come out of the box – it’s just a nice bonus to have that third. For Gartner, that third controller was also the biggest challenge during filming because the controller was never meant to be actually mounted to a camera. Through ingenuity and a bit of DIY rubber-banding and tape, he was able to get it done with smooth tracking (shown below). This initial test footage that Gartner has shared is in preparation for shooting the Fantastic Contraption trailer next week, where the team will use a full green-screen studio instead of Gartner’s home office. Fantastic Contraption will be released as a launch title for the HTC Vive in April and should feature close to 100 levels from day one. I must say, it has been nice watching all these experiments unfold. We have been following the mixed-reality streaming experimentation of Northway Games since their first demo back in December. Even those early demos on Twitch, although very experimental, were a first-of-its kind. You can see a live-stream Twitch example below. Trying to describe what its like to experience a game like Fantastic Contraption in VR to someone who’s never experienced room-scale VR before is not easy. Sometimes the only way to understand what it’s like to experience a fully interactive 3D virtual world is to experience it for yourself. From freely walking around in an environment to bending over and picking up an object off the floor to only throw it into the ether – it’s an absolutely transformative experience. Colin and Sarah Northway’s mixed-reality Twitch streaming green screen setup. What the team at Northway Games and interactive developers like Kert Gartner are experimenting with in VR is the future – and an exciting one at that. 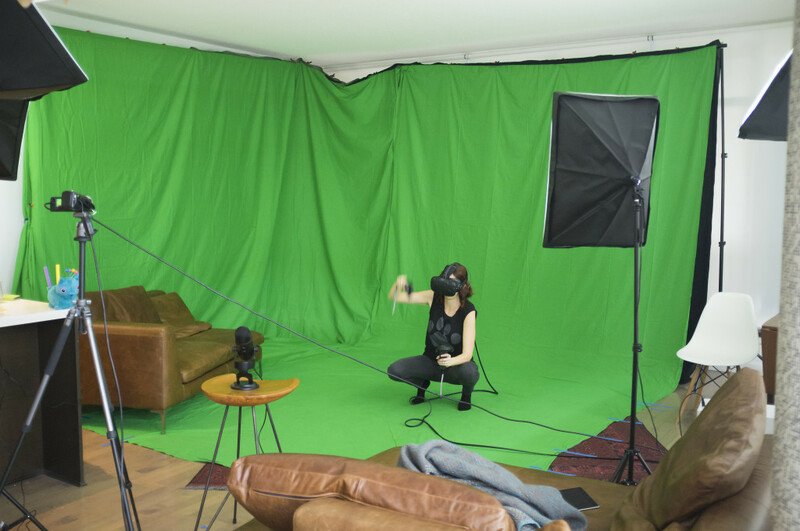 In the near-term, where high-end room-scale VR systems like the HTC Vive may not be as accessible to the general consumer as we would like, mixed reality demos like this will help immediately convey what a person in VR is experiencing. You won’t need to find the nearest VR arcade to try a game for yourself or watch split screen videos trying to demonstrate what a user is doing in real-life and in virtual reality at the same time. With experiments like Gartner’s mixed-reality Fantastic Contraption demo, you can just push play or join a Twitch stream live and immediately understand. Like all of us, the team at Northway Games wants to see the VR community flourish and have been very open about sharing what they learn from all their experimentation. When speaking with the team earlier this month at the Vision VR/AR Summit, one thing they are considering developing is a Unity plugin based on the tool they built that will allow other VR developers to create mixed reality video streams as well. One thing is for sure, the way we will watch VR demos, trailers and live-streams will never be the same – and that is something we should all be very excited about.